Oh my apples, have I got a drink for you. 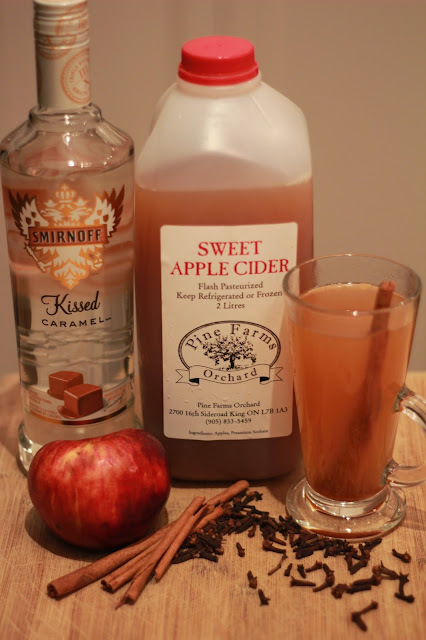 In keeping with my apple themed recipes, I offer you the most perfect cozy, fall drink. A few months ago, I picked up Smirnoff's kissed caramel flavoured vodka. Why? because I love caramel. Well, it sat on my bar cart for months because I couldn't think of what to mix it with. Fast forward to this past weekend - caramel...apples...jackpot!! I went back to the apple orchard and got a container of apple cider to make what ended up being one of my new favourite warm your belly drinks. If you're serving for guests, rim the mugs with sugar. I don't need or want the extra sugar so I just serve it up in a mug and garnish with a cinnamon stick. You'll notice my mug is missing the marinated apples. They actually never made it out of the pot, I ate them before I could photograph the end result. Hey, I said no judgement, ok? If you would like a more classic twist on this, add a splash of bourbon along with the caramel vodka. I love caramel almost as much/perhaps more than I love coconut. Love this recipe and would love a similar one for warmer weather with my next favourite flavour (you guessed it coconut). Your posts are beautiful.